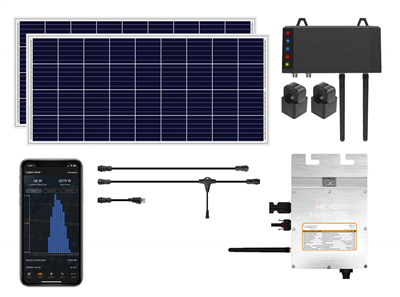 Legion Solar is scalable, do-it-yourself (DIY) solar solution that is easy to install and pays for itself 3x faster than traditional systems. Consumers can easily design a system that fits their unique budget, needs, and lifestyle. Solar Regulator - Contains the solar energy that you produce behind your utility meter by regulating energy production of each Micro-Inverter so that energy production is less than or equal to energy consumption. Plug and play installs in minutes - Setup and monitoring with smartphone app via Bluetooth connection available for Apple and Android. Monitor your savings - The Legion Solar App allows you to monitor your system’s performance from your Apple/Android device. Expand at any time - Legion Solar offers a flexible system that meets your current budget, needs, and lifestyle. When you're ready to upgrade to a bigger system, adding panels is easy.